Under the Weather? 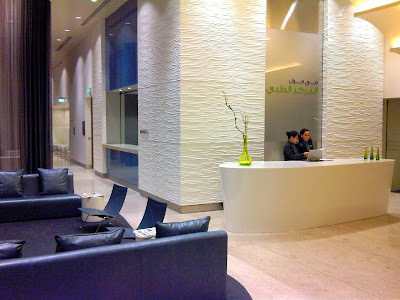 Burj Khalifa Medical Center has you covered! 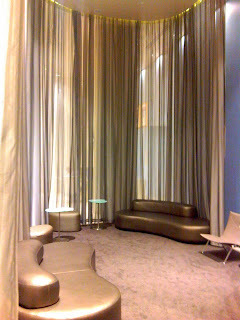 And if you're lucky enough to be sick here, you get a waiting room that is nicer than your living room. This is a far cry from the public hospitals around the Middle East where you're as likely to get diagnosed with pregnancy as you are a broken wrist, so we certainly welcome the change. It's a tried and true formula: New Hotel + Infinity Pool + Drinks + Lounge Music = Chic Weekend Revenue Stream. 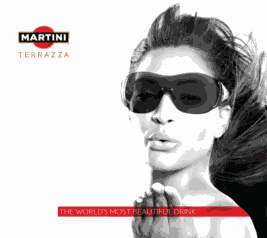 Martini Terraza, who held a private launch for media last night, is the perfect example of that rule applied. Located on the 4th floor outdoor pool deck at the Address hotel in the Marina, it's a great spot overlooking the promenade. 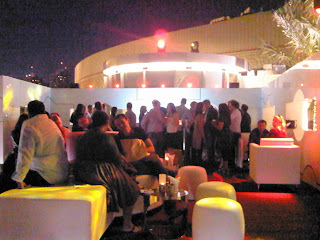 We dropped in to sample the drinks and the ambience, and were pleased with what we saw. Wanted: Angrogenous but stylish dresser with white shoes and tight shirt. Must be well-versed in iTunes, and familiar with Apple's Lounge Music Mix #7. Available to work nights. Ability to look busy without actually doing anything a strong plus. Overall, we expect Martini Terraza to do well - if you're lucky enough to spend a Friday afternoon chilling out on the sundeck, change into your best white pants and chill the night away as well. When the first half of your email looks like this, you know it has to be good! That seal, the language, oh yes! The Political Science major in me was jumping for joy. 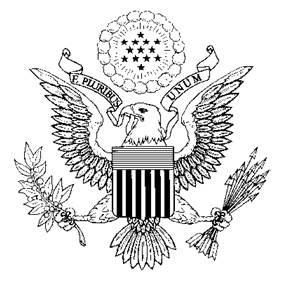 It turns out that being elected to the Board of the American Business Council has its perks (3 hour meetings not so much, and invitation from the US Ambassador, oh yeah!). As a Board member I was invited to a reception in honor of all the American companies that came to exhibit at the Arab Health conference that was held this week. As I approached the entrance there was a security bag check, and then a list you had to have your name on, and you had to turn in your invitation, so by the time I had handled all of that I was left with the purse tucked under my arm, holding an invitation in one hand and my iPhone in another as I texted Matt the directions to the event. I should have known better. As I walked through the doorway out on to the poolside patio mindlessly multitasking and looking at my phone a deep voice said "hello, and thank you for coming." I looked up to see the out stretched hand of His Excellency Richard Olson. "Oh, Mr. Ambassador!" I exclaimed as I shuffled my phone from one hand to another and quickly tired to regain my poise. "Thank you for having me." And then it was over, I was holding up the line. Darn! It's not like I was expecting to discuss major policy initiatives, but I would have liked to be a bit more on the ball! The event was fantastic. A full buffet and libations were included and we even had the Minister of Health in attendance. I've learned my lesson for next time - no phone or invitation is going to distract me! ...in my beautiful, my beautiful ballooooooon. 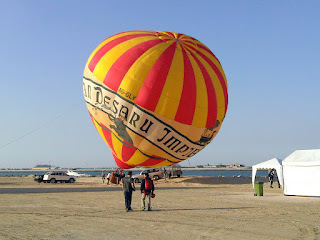 I just couldn't get this song out of my head on Friday morning as I was sailing across the desert in a hot air balloon. The adventure began on Monday while I was cleaning out our desk drawer and I came across a gift certificate for a free hot air balloon ride. Where did this come from? I wondered. A quick dash into my memory bank reminded me that Matt had bid on this prize at a silent auction almost a year ago! I quickly checked the expiration date - we had four days left! We placed the call immediately and booked a slot for the upcoming weekend. Great! Then came the bad news: we needed to be there at 5:15am! There are a few good reasons to be up at 4:30am, so far I've catalogued 1) catching the sunrise over Masada 2) going on a morning game in the Masai Mara 3) or of course, having stayed up until 4:30 from your bachelorette party and having breakfast at a 24 hour diner in NYC...I was hoping that I could add hot air ballooning to the list! With our early start, we then headed an hour out into the dessert of Al Ain, about 100km from Dubai. When we arrived it was just us, the goats, the camels and few Bedouin villages. I can't say that I was that nervous, but for the record I hadn't floated above the earth at 2,000 feet in a basket before, so I was cautious. Then our excitable pilot came over to introduce himself, "I am Hungarian, and my name is Attila...just like the Hun." Oh boy, now I was nervous. Once they puffed up the balloon with hot air Attila warned us that we would have to get in quickly because we would need to weigh the balloon down before it floated away with him in it. When he gave the order "go, go, go!" it was a little crazy. Everyone started running towards the basket and flipping themselves in, all while stepping on everyone’s fingers and toes. I may have thrown a few elbows, but hey I wanted a good 'seat'! Then we were soaring. It was awesome. All the while Attila reminded us that we were never actually flying taller that the newly opened Burj Dub...errr, Khalifa. We saw a glorious Arabian sunrise over the desert (definitely made the cut for reasons to wake up) and got an amazing bird's eye view of the serene dunes. Currently we have job opening in Canada and Australia,for differnt categories, like fish cutters,fish packers,lobsters,engineers,supervisors,accountants,cleaners, and many more.salary range is between 13usd to 22usd per hour you will work minimum of 6 hrs per day.we arrange 2 years work permit/visa.if you are highly interested kindly contact us for futher processings. Director General, Linkvisa Recruitment company Ghana. #119b accra new town,accra ghana. tel+2335489660. As I entered the park there were bodies strewn everywhere on the lawn. People were rolling around in pain grasping at their knees, and ankles. Some were having ice water dumped over their heads while others were throwing their legs up on any flat surface they could find in a desperate attempt to stretch. Then the music started pumping and Ethiopian dancers flooded the scene. This was a celebration? The carnage on the ground was apparently the successful completion of the Dubai marathon! Their boy came in first place, it is still a reason to celebrate! Upon closer inspection I realized the people writhing around on the ground were smiling and in high spirits – still looking good for running 26.2 miles! The course was up and down the Dubai coast line on the Jeremiah Beach road which provided a nice flat (although some runners would say boring) run. It’s known for being an “easy marathon” (is there such a thing?) so hopes were high that Ethiopian runner, Haile Gebrselassie, would break his previously set world record of 2:03:59. 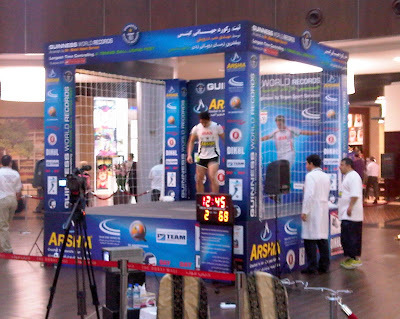 Due to a bad back he came in with a paltry 2:06:09, ahem. I’m still trying to take a shower, blow dry my hair and apply makeup in less than 90 minutes! Nice work Haile! Probably the only time I will stand in the middle of Jumeirah Beach road! Rocking the sneaks with the abaya - love it! In other news, our good friend John whose been training for months for his first marathon collapsed on the course with 1 mile to go, and remained unconscious for an ambulance ride to the hospital where he was unaware of the fact that he even ran a marathon for the next few hours. He also though he lived in Singapore, yikes! It was a severe case of dehydration. Thank goodness he is ok, but it goes to show you kids – don’t try this at home! Lastly, if you need a safe alternative to wear out the kiddies, just stick them in one of these hamster balls on the nearby small lake in Media City. They can run forever and never go anywhere! Dubai is nothing if not random. 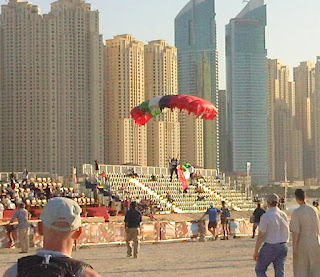 On any given day in Dubai you are faced with series of random events that just puzzle the mind. It's not uncommon to have things like this happen to you: "What do you mean road closed? This is the way I've gotten home everyday for two years!" or "Hey is that Victoria Beckham in the steam room?" or "I can buy date juice but I can't find orange juice?" The fast-paced life of this city means that when you step out the front door you truly never know what you are going to see. Especially in our neighboorhood. The Burj Downtown area used to be this sleepy little construction site when we moved in, and now maybe you've heard of it? We've got the world's biggest mall, largest fountain, and tallest building? What's that? You don't know what it is? Well isn't it obvious? It's an offical Guinness Book of World records site, where the young man on the stage is going for the record of "most consecutive bounces on the top of the foot with a tennis ball". Duh. It was interesting I guess, if you follow the sport, er..activitiy? It was entertaining for a few minutes, but when I started getting dizzy watching him, I can only imagine how the acutal competitor was feeling. Also note the MD in the lab coat closely obversing his phsyical health. What is the worst that could happen? A crammped toe!? I wonder if they'll send one for me when I decided to go for the "most chocolate covered pretzels consummed on a Christmas Day between 1pm - 4pm" record. I might actually need the doc when I got into a sugar coma! Although to end on a high note - he set the record! Just to add to the total randomness of the day. I guess they are trying to turn the sidewalk in front of our building into Dubai's very own 'Walk of the Stars'. I had no idea. It was strange though just to have one of these plaques sitting in the middle of the sidewalk by itself. Monica Belluci is a little lonely out there, we need to get her some more friends! This weekend Matt and I got our fair share of laughs when we attended a stand-up comedy show headlined by Jon Lovitz. It's pretty challenging to write a G-rated review on what was a decided R-rated show, but I'll give it a go! 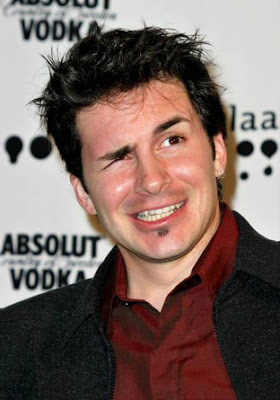 American Hal Sparks was the opening act and he had us rolling in the aisles a few times. He was funny! His bit started out with a few observations about the renaming of the Burj Dubai to the Burj Khalifa which illicited alot of nervous laughter from across the room. (It WAS funny.) In one of the moments I can actually quote he demanded that he will no longer stand for being called a "non-smoker" and that smokers should be called "non-breathers". Bravo! 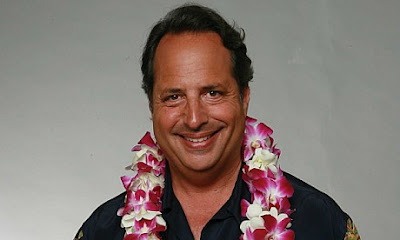 He put on a great show for us, and if I dare say, was alot funnier than Jon Lovitz. Jon did a pretty good job, but his stage-presence was pretty lack luster. He had us laughing for the first half of the show, as he drew comparisons between all different types of religons and ethnic groups. However, the second half of the show seemed to be dedicated to making fun of Bob Saget (of Full House fame). Yeah. Odd. Who doesn't like diet advice that includes butter, cream and beer as part of a healthy routine? This was just some of the 'interesting' healthy food tips we received at the Expat Woman "New Year, New You" breakfast. The ladies at Expat Woman always put on a nice event, and to kick off the new year they brought together a variety of vendors from fitness instructors, spas, jewerly designers, and contining education courses to help us all kick off the new year in the right way. Lisa and I, along with our friend Meredith enjoyed some breakfast (note: danish is not a good way to kick off a diet!) while we perused the stands and took advantage of samples. My sister was even lucky enough to nab one of the free haircuts they were raffling off. However, the highlight of my morning was the speaker who was headlined as a local chef who was going to share some healthy food tips with us. He was the chef at the Belgian Beer Cafe (located in the Grand Millenimum hotel who was hosting the breakfast) and although he was a nice guy I'm not sure if his advice could compete with that of a dietician. Here are a few memorable quotes. I think he would have inverted the food pyramid if he could. 9-11 servings of heavy cream a day, anyone? "They first started focusing on 'healthy food' in the US. I'm not sure why. I think it is because alot of them are getting really fat." "Eat tomatoes they are good for the heart attack." "Strawberries are ok, but too many can be poisonous." "You can eat anything as long as you do the sport. Look at me, I'm skinny." And my favorite, "Life is too short, eat what you want and be happy." After his talk/comedy routinue which had all the ladies laughing. He shared with us a menu that he prepared for us, if we want to make a healthy meal at home. Amongst the suggestions were endive salad with blue cheese dressing and French onion soup with a cheese top! Whew! If this is diet food sign me up! It's just like watching a baby being born. 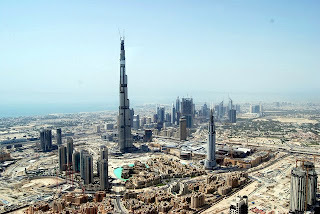 The Burj Formerly Known as Dubai (TBFKAD) has become the Burj Khalifa, and opened for business. Our building had a great view (see the picture at the top, shot from the balcony) for the festivities, and our friend Tom threw a party from his even better view six floors up. 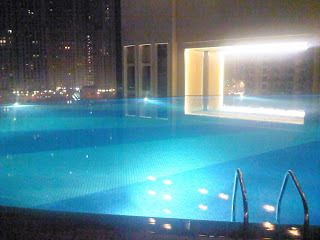 I'm sure you all know the deal by now - 828 metres tall, the highest pool, mosque, and observation deck. With all 18 mechanized building washers running, it would take 2-3 months to get the sand off the building. A host of ‘Burj Khalifa parties' also took place at the apartments of those lucky enough to have balconies offering superb views of the opening. Tom Arnold, originally from the United States, threw a party in his Downtown Burj Khalifa apartment. He said: "The Burj Khalifa is not only a feat of modern engineering, it is also a symbol of mankind's relentless pursuit of innovative achievements. The event I am hosted included guests from around the world who defy the destructive myths of this region and live together in one of the most peaceful cities around the world. This is truly a global city, and a universally appealing experience to witness and share together. "As expats living in Dubai, we have come to consider this place our home, and we are proud of the city and what has been accomplished here in recent years. We are here working, not as individuals, but as part of a collective higher purpose. "Today is a proud day for Dubai and my friends and I appreciate the magnitude of this historic achievement." Happy New Year from the edge of the earth! Matt and I were very lucky to spend New Year's Eve on Waikiki beach on the Hawaiian island of Oahu. It was fabulous! Before you tell us that we are getting a little to travel-happy you must understand that I had 300,000 Delta miles that were due to expire at the end of the year. After a quick look at the miles map it became pretty clear that the best 'domestic' deal was Hawaii, so off we went! We started NYE day off at Pearl Harbor. The weather was beautiful and the shine was shining. It was hard to believe we were looking at the scene of the most deadly attack on American soil. Matt and went through all the exhibits and even had the chance to climb through the USS Bowfin, a WWII sub that is moored in the harbor. Sitting on a torpedo at the front of the Bowfin. Doing my best "Rosie the Riverter" on the decks of the submarine. From Pearl Harbor we headed to our dinner cruise which was sailing off the coast of Honolulu, Waikiki and Diamond Head. We saw a magnificent sunset and for the first time in our lives - the green flash! I was thrilled with the lobster dinner, I just didn't know I was going to get the whole crustean on my plate...Matt had to help with that. Hanging out on boat just before the last sunset of 2009. See ya next year Sun! Matt managed to catch this shot just as a sail boat got in front of the light. 2009 was such a good year we just decided to make it last as long as we could, and by celebrating it in Hawaii, we were some of the last people to countdown the clock in the whole world (only Midway celebrates later than us)! By the time we sang Auld Lang Syne it was 5am on the US East coast and 2pm in Dubai the next day. We rang in the New Year at a huge beach party on Waikiki complete with a spectacular fireworks display. Our only resolution is to make this year even better than the last - Happy New Year everyone! The scene at the beach front. A very special blue moon just for the New Year! The picture at midnight. Cheers! Happy New Year! Brrrrr...after spending a wonderful Christmas day with both of our families, we took a Shaver-Mueller family outing on the 26th. We returned to the original site of the wedding festivites, the National Harbor, and took in the Gaylord National hotel's ICE! experience. It consisted of a carved winter wonderland that included many holiday scenes, an ice sleigh and even racing ice slides. The ice world was created by 40 Chinese artisans over 6 weeks. They hail from a region in China called Harbin, located in Northeast China, where relentless winter winds blow across from neighboring Siberia. The average winter temps fall dramatically to an average of only 2 degrees... sometimes plummeting to -36. Harbin stays below freezing for almost half the year. They have honed their skills by cutting ice blocks from a nearby frozen river and creating ice sculptures. We had a blast! Although we were less than fashionable in our standard-issue blue parkas, they were necessary in the 9 degree enviroment! It was definitely a unique experience and it was fun to share it with the whole family. 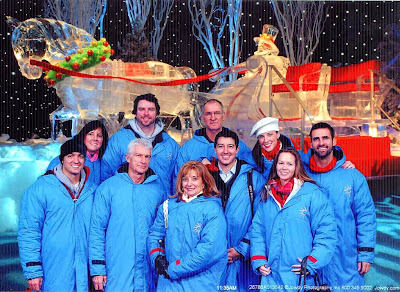 Family shot in front of the ice sleigh. Hanging out with the peguins. The dye the ice with food coloring which, if you are Matt, ends up all over your hands. The ice palace was awesome! Complete with racing slides. Matt's Mom shows off the 15 foot tall ice angel. Mom and Wade race down the slides!